Love the die cut showcasing this fabulous scarecrow! Wonderful colours too. Beautiful coloring and a very pretty card Connie! Love that scarecrow. I'm thinking that even a scarecrow wouldn't scare the squirrels out of this yard. They're loving the pecans here. Your coloring of the image is nothing short of wonderful, and the layout is so creative! Love the die cut behind the scarecrow. Thanks so much for joining us at Jo's Scrap Shack. Fabulous card Connie, lovely coloring and design! Great card Connie and super colouring of that darling image as well. I do love mixing Pro markers with Polychromos pencils - so effective for shading especially! What a wonderful image, beautifully coloured and shown off to perfection, LOVE it. Oh boy! I absolutely LOVE scarecrows and I think yours is the first Mrs. Scarecrow I have ever seen! She is a beauty too! I love the way you colored her and that Sue Wilson die sure makes a great statement! Gorgeous card. Thank you for joining us over at Di's Digi Designs and hope to see you again soon. 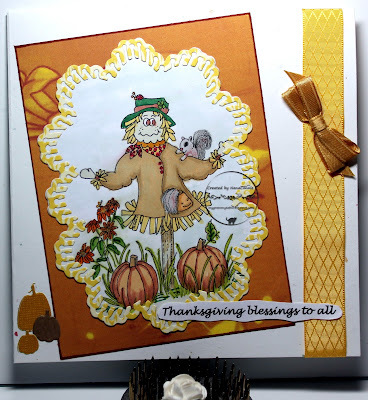 This is such a fun fall card! Thanks for entering it in the SumMore Fun mood board challenge! Cute image on such a pretty card. Thanks for playing along with the SumMore Fun Mood Board Challenge. Such a cute scarecrow image. Definitely feed the squirrels. They do a pretty good job but it will be cold this winter. Thank you for joining us over at SumMoreFun for our Mood Board Challenge.